When Barbra Streisand announced she was touring in 1994, the 18 shows sold out in one hour. The tour was scheduled to begin in London at the 12,000-seat Wembley Arena. She arrived in London on April 16, 1994. Boots pharmacy chain contributed 1 million in Streisand's name to the Variety Clubs of Great Britain. So, on April 19th Barbra took a break from the concert rehearsals to hand over the keys to 32 specially equipped "Sunshine" coaches for use by disabled children in England and Northern Ireland. My first time in Europe! People have been asking me, you know, why are you touring after 28 years? And I tell them, if you came from California — between the earthquakes, the mudslides, and fires — you'd hit the road, too! I love London. [shouts from audience]. I love you, too, I love your accents, your manners. I chose it to be the first city on my tour because I love London so much. I loved it from the very first moment I came here, I remember, in 1961. I love — besides the people, the architecture, the sense of history — I even love the food. I could live on little tea sandwiches with the crusts cut off! Anyway, I couldn't wait to come back here again. In 1966 I opened in Funny Girl at the Prince of Wales Theatre, and I remember opening night Princess Margaret came. And the audience was so distracted by her presence that their reactions were way off. So when she came backstage I said to her, 'You should be here on a night when you're not here.' She never came back." On April 24, 1994—on a night off from the show—Elton John threw a 52nd birthday party for Streisand at Mimmo D'Ishia, an Italian restaurant in Elizabeth Street, SW1. Pictured above, backstage at Barbra's 4/20/94 show: Shirley Bassey, David Frost, Michael Caine, and John. Streisand's April 25th show aided The Prince's Trust and the Children's Variety Club of Great Britain. Prince Charles attended the April 25th show and met with Streisand, Marvin Hamlisch and Marty Erlichman backstage at a champagne reception before the show. Charles sat in the royal box. Other celebs attending that night: Holly Hunter, Joan Collins, Lulu and Priscilla Presley. (Photo, above): Marvin Hamlisch, Prince Charles, Marty Erlichman, and Barbra backstage at Wembley. 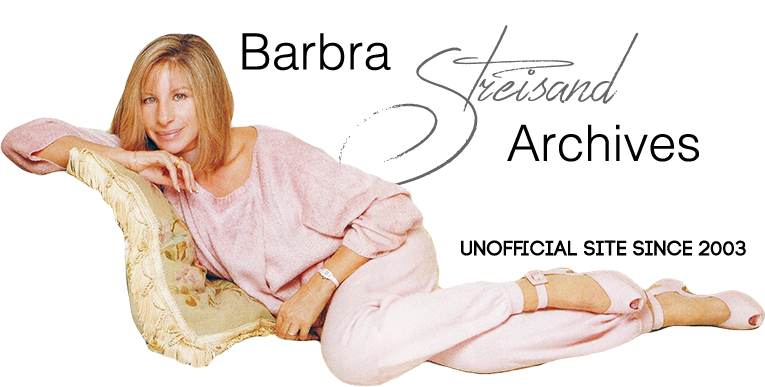 The show underwent more tweaks while in London: Streisand utilized a different line (supplied by Stephen Sondheim) in "I'm Still Here": "If she won't cap her teeth, she should cap her nose" was replaced with "As for the nose, it's like Cyrano's." Barbra deleted "Once Upon A Dream" from the Disney medley. And Barbra premiered her "Yentl" medley, singing along with the video of herself on "Piece of Sky." April 20 & 27 shows sell out; April 25 & 29 added and sell out! April 27, 1994: UK show Top of the Pops records “As If We Never Said Goodbye” at Wembley, airs it next evening.